Call for Research Application Summaries/ Extended Abstracts. RUFORUM is a network of 85 Universities in 35 African countries with mission to strengthen the capacities of universities to foster innovations for strengthening agri-food systems through the training of high quality researchers, the output of impact oriented research and the maintenance of collaborative working relations among researchers, farmers, national agricultural research institutions and governments. The RUFORUM Sixth African Higher Agricultural Education Week and RUFORUM Biennial Conference, will be held 22 – 26 October 2018 in Nairobi, Kenya along the theme “Aligning African Universities to Accelerate Attainment of Africa’s Agenda 2063”. The Conference will bring together over 800 participants to discuss and recommend how to strengthen higher agricultural education in Africa to effectively support the attainment of Agenda 2063 – the “Africa We Want”. The meeting will bring together key development partners and stakeholders including Vice Chancellors from agricultural universities, university staff and students, private sector and civil society representatives, policy makers including from the African Union Commission and member countries, Regional Economic Communities and Sub-regional organizations, development partners, members of the press and others. 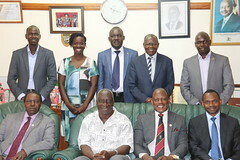 The meeting will be co-organized by RUFORUM, and all the RUFORUM Member Universities in Kenya and other partners. The African Higher Education Week and RUFORUM Biennial Conference is held once every two years. As part of strengthening dissemination of research outputs and lesson sharing RUFORUM invites interested authors (University researchers, researchers and scientists from National, regional and international l Research Institutes, Higher Education stakeholders and beneficiaries of RUFORUM supported projects, including postgraduates students and their supervisors) to submit Research Application Summary/“Extended Abstract” maximum of 8 page (for examples and guidelines of developing Extended Abstracts please visit RUFORUM website. The deadline for submission is 15th October, 2018. The Abstracts should be submitted via an online platform accessed from the African Journal of Rural Development website. For inquiries about your submission please use ruforumbiennial2018@afjrd.org and editor@afjrd.org All submissions will be peer reviewed and published as open access resource materials in a serialized RUFORUM Working document series (ISSN: 1993-8462) which will be made available to various stakeholders in both print and electronic formats. The publication is bilingual and authors are free to submit abstracts in either English or French.